Many people walk into our Indianapolis flooring store wanting to look at hardwood flooring options. While looking through our wide selection of hardwood floors, people often have questions about how that wood flooring will best fit in their home or how to narrow down the choices. We've compiled the most common questions and ended up with a useful FAQ for hardwood floors. How do I choose the right type of hardwood for my home? 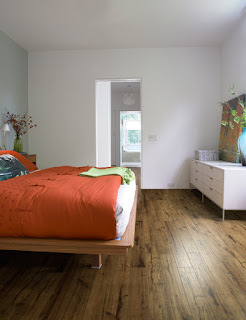 If you like a more Traditional look, then you may want to standard 4" plank width with a medium to light color. If you are looking for a more Country style, then you should look at 5" planks or wider and consider a wood species that has a lot of "character" - meaning it shows some knot holes and has a distinct wood pattern. Will the floor see lots of traffic? You should consider a harder species of wood to stand up better and one with grain showing to mask scratches. What are the existing furnishings or cabinets? You'll want to complement them with the color and finish of your wood floor. How much light does the room get? This could influence if you select a lighter color or darker stain. Can I use hardwood flooring in my kitchen? Yes! Finishes used on today's hardwood floors can stand up to heavy traffic and use. They resist wear and stains and do not require stripping, buffing or waxing. It is good to remember however, that liquid spills can still cause damage and should be wiped immediately with a clean, dry cloth. What's the difference between solid hardwood and engineered wood floors? Engineered wood has a wood core and a veneer of natural hardwood as the top layer. An engineered wood floor tends to have a tougher, more durable finish but in many cases the same finishes can be applied to solid hardwood. The biggest difference comes from the wood core of the engineered flooring, this makes it more stable than a hardwood plank and it can be used in more situations where solid hardwood is not recommended. Bottom line: both are long-lasting, beautiful choices. Are laminate wood floors right for you? Can I install wood flooring over existing floors or a concrete slab? You cannot install solid hardwood in these situations. However, in both cases engineered wood floors can likely be installed. We recommend you have a professional installer measure and evaluate the room to determine the most suitable wood floor option. For a true, renewable wood floor you need to look at bamboo and cork flooring. Both offer many of the same features of solid hardwood that attracts homeowners but both are made from resources that renew themselves much faster than trees. Today's hardwood flooring manufacturers are much more responsible with harvesting and planting new trees. It's also worth considering the fact that your hardwood floor can last over 100 years and will not need to be disposed of or replaced any time soon. Learn more about different types of wood flooring.